Cygnus Instruments offer a range of surface thickness gauges which all feature the Cygnus-pioneered multiple-echo technology that provides an accurate metal thickness measurement without the need to remove any protective coatings or damaging the material being tested. 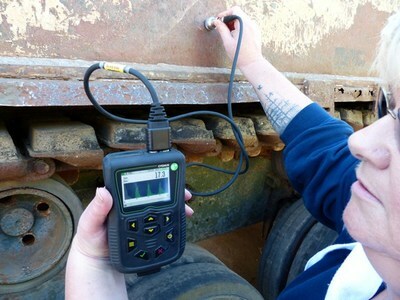 Incorporated within the latest PLUS Mult-models are echo-echo and single-echo measuring modes to assist in obtaining measurements in areas of extreme corrosion or back wall pitting. Certified intrinsically safe to ATEX Marking Group I & Group II, CSA Class 1 Group A, B, C & D Division 1, the Cygnus 1 Intrinsically Safe Multiple-Echo Ultrasonic Thickness Gauge uses the multiple-echo technique and has been designed for measuring metal thickness and corrosion in potentially explosive environments. The gauge can also be used in Zone 0 / Zone 1 hazardous areas, requires no plant shutdown or hot work permit and is approved for use in mines. With its end-mounted LCD display, the Cygnus 2 Hands Free Multiple-Echo Ultrasonic Thickness Gauge has been designed for safe use in rope access or belt-mounted applications. Designed for climbing, rope access and belt-mounted applications, the Cygnus 2+ Hands Free Multi-Mode Ultrasonic Thickness Gauge has a rotatable end-mounted LCD display and incorporates three versatile measuring modes - multiple-echo, single-echo and echo-echo. Ideal for most hand-held industrial or shipping inspection applications, the Cygnus 4 General Purpose Multiple-Echo Ultrasonic Thickness Gauge uses the multiple-echo technique for reliable thickness measurements through protective coatings. Offering features such as sequential data logging, a large A-scan display and three versatile measuring modes (multiple-echo, single-echo and echo-echo), the Cygnus 4+ General Purpose Multi-Mode Ultrasonic Thickness Gauge is ideal for most hand-held applications. The Cygnus 6+ PRO Multi-Mode Ultrasonic Thickness Gauge offers an array of features including: comprehensive data logging; A-scan and B-scan real time display; multiple-echo, single-echo and echo-echo measuring modes; Bluetooth connectivity; a unique duel display; plus much more. The Cygnus Heavy Duty Multiple-Echo Ultrasonic Thickness Gauge is an extremely rugged thickness gauge that is simple to use and provides accurate metal thickness gauging measurements in harsh environments.